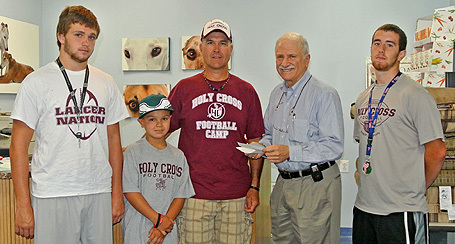 Many players from The Holy Cross High School Football Team from Delran, NJ volunteer to walk the greyhounds on Sunday mornings throughout the year accompanied by their coach, Mr. Frank Holmes, and his family. As a result of their interest in the National Greyhound Adoption Program, they recently participated in the "1st Annual Lancer Nation Bench-A-Thon" held at Holy Cross High School in August as part of their team service project. Players were asked to collect donations (per bench press pound lifted) and competed within four divisions (Bulldog Division - 145 lbs and above; Boxer Division - 146-170 lbs; German Shepherd Division - 171-210lbs; and the Rottweiler Division - 210 lbs and higher). The fundraiser was a huge success, raising over $2,000 for NGAP. We truly appreciate their hard work and effort!